Yep, I'm back on a VFR of all things, in that I knew I'd like an 8 spoke off the 90-2 version, Ha, they are getting hard to come by so I find, but did land one finally, then fought over a color and came full circle to white, but not just any white, a silver iridescent with a pearl hue. Now the rear is done, on to the front. But after a look this morning in the sun, I'm liking the two tone mix of Black & white I know, Crazy huh? beansbaxter, Willow and equinity like this. I like the white wheels for that color. I'm liking the White too! That is a great looking bike. I like the white wheel. Personally I would want the front wheel to be white as well, but that is probably just my OCD talking ...and I do not have to keep them clean. LOL, yea I'm going to do the front the same, this just took me by surprise that it didn't throw me a Oooo ukkk! in that it kinda looks cool...almost. Lucky me, I don't have a problem in keeping it clean. Besides that goes with the helmet better too. Methinks I prefer the original wheels on this gen viffer. In white of course. What is the interweb majority consensus nowadays? Why did Honda put car-style lug nuts on this model? And single nut center lock wheels on the RC30, RC45 and jdm domestic 400cc jobbies? That's been the question for the ages, why Honda did that, they all ready had the single nut in place. A few folks that have the time and money as now, Now you need an almost unobtainable rear wheel. But it's been done by buying the rc45 rear hub. Thats what I'm talking about right there Sweet. if only. This is your stock wheel yes? 5th/6th gen? Those spokes look the best to me. Very sharp and "machined" looking. Rather like a Marchesini knock-off. Yep 5th gen is what was on it. Yea it's a personal choice, the 5th and 6th gens now been in production with that wheel for 12 years, kinda boring IMO. The 8 spoke 3rd was a swing to be a bit different, plus a move up from the 4th gen 5" width back to 5.5" They are getting a little cult following now. The new 8th gens have a nice 10 spoke, but like Honda, they kept the ^%$dang lug nuts, only this time went 5 lug, so one can't easily put one of those on with out again buying a new hub assembly, which one guy has, but he works at a Honda dealer and that still ran him $1400.00 go figure. Looks fantastic! Would look even better if your bike was yellow. I had mine painted black. 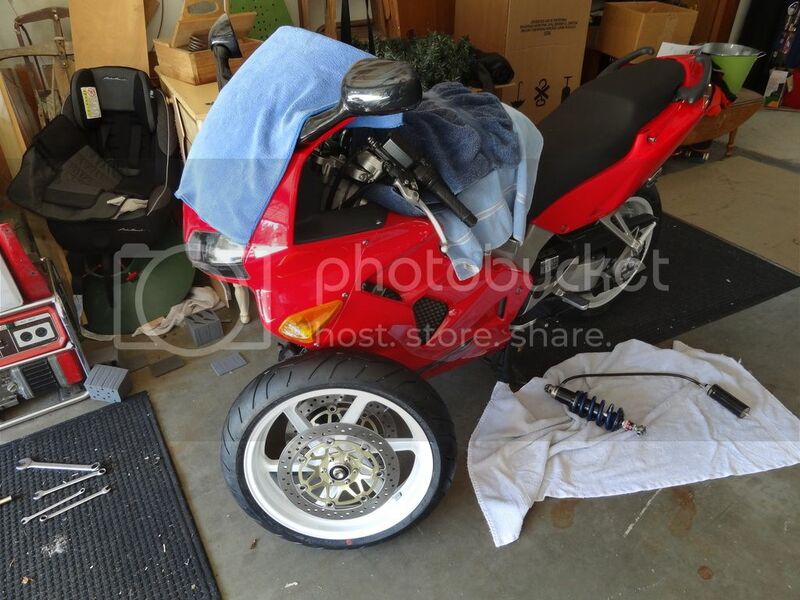 But your wheels are much better than the stock 5th gen.
^ok there's the other spin, paint the vFR Black. got it . 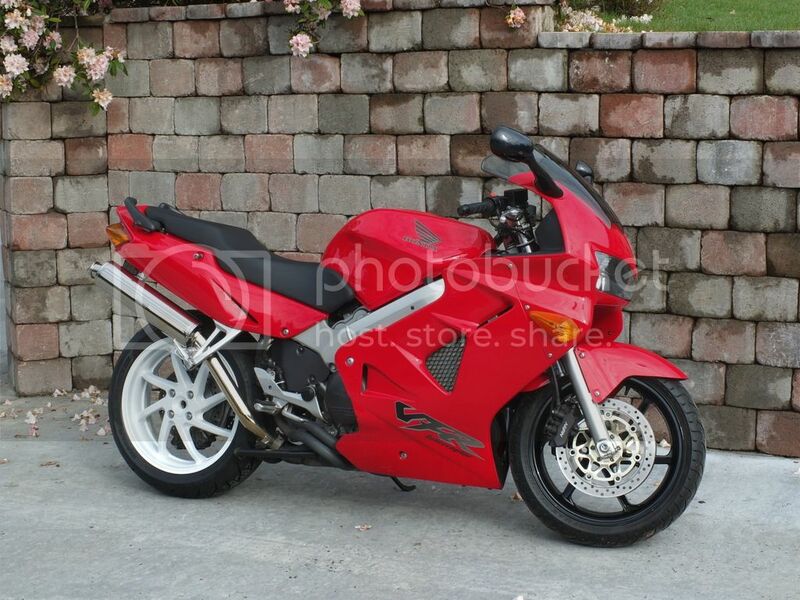 had this VFR been in bad shape paint wise, I would have painted it white too. Black with white wheels would look sharp. Mine was red, but I've never been a fan of Honda red. also if one notices, there's a new rear shock there that's going in..
Willow, VeritasImageryNW and Davidk like this.